Sometimes the best laid plans aren’t good enough and IT has to play detective. That’s what happened last week at the Toronto Pan Am/Parapan Am Games media centre where 1,700 press from the Americas expect fast Wi-Fi to do their jobs. Technicians from Texas-based AmpThink LLC, which integrates Wi-Fi systems in large facilities including warehouses, retail chains and stadiums, thought its detailed plan for locating access points throughout the structure was good. According to Bill Anderson, founder and mobility consultant for the company, one of AmpThink’s strengths is its ability to predict the right places for APs, configure them before installation and then bar-code equipment so local engineers just have to follow the map. Unfortunately, as reporters, editors and broadcasters were pouring into the centre last Friday on the eve of the opening ceremonies, the Wi-Fi performance was slower than predicted. The problem was one that CIOs are familiar with: Rogue APs. While the room was wired for the Internet, a number of broadcasters set up their wireless networks — some Wi-Fi, some not — for their own uses that in some places interfered with the Cisco Aironet 3702 access points AmpThink was using. “By the time they finished they basically consumed all of the available spectrum in the room,” Anderson said. Usually in a project the firm has full control of a premise. Here it didn’t, so AmpThink couldn’t ask people to turn the networks off. AmpThink quickly flew up technicians from Texas to find a solution. They realized that inside the Aironet 3702 AP is a chip that can be converted to a spectrum analyzer. “We deployed it in the centre of the media centre, turned it on and started to go channel by channel and identify what was on each of them,” Anderson said. At the same time technicians mapped all of the wireless networks in the building, found channels that were underutilized and figured out a way to re-configure the Aironet equipment to use them, as well as to favour computers that could run 802.11ac. By Saturday the network was performing better. That was one of the challenges Anderson’s team faced. AmpThink was chosen by Cisco [Nasdaq: CSCO], the games’ IT infrastructure provider, to install Wi-Fi networks in a number of facilities being used by the games so both the media and the public can have wireless access. The press and the public share the network, but the media — who often transfer still photo and video files — have been guaranteed a certain amount of bandwidth. For the Toronto facilities the Wi-Fi links to fibre backbones built by Beanfield Metroconnect. Some facilities — like the cycling velodrome and the Rogers Centre, where Toronto’s Blue Jays play baseball and the opening and closing ceremonies are being held this month, are permanent structures so could be set up earlier this year. But others, like the beach volleyball stadium built around temporary stands, meant that APs had to not only be sited for good coverage but also fastened securely yet could be removed when the structure was disassembled. 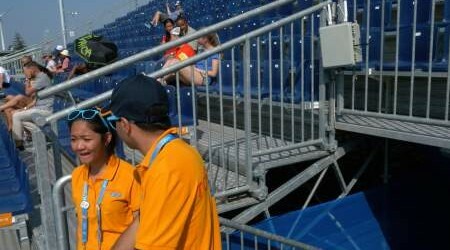 At the beach volleyball centre, APs in protected housings were fastened to the railings over entranceways so they’d be in the middle of the stands. Anderson said AmpThink tries to give spectators throughput of at least 1 Mbps. Speeds, of course, will depend on the number of people on the network. When I was there for Monday morning’s beach volleyball competitions the stadium was three-quarters empty. The worst I got on my smart phone was 26 Mbps. On the first weekend of the games over 35,000 people used the free Wi-Fi, including 7,000 at the opening ceremonies, reports Jeff Seifert Cisco Canada’s CTO and the company’s technology lead for the event. At the opening ceremonies 1 TB of data was uploaded by all users during a six-hour period.